Your visitors are less likely to respond to your call-to-action if your site is full of links, banners and flashy things. Visitors will respond better to your calls to actions. b. If you don’t sell advertising but post affiliates and other banners. In the majority of the cases graphical advertisements cause more distraction than they’re worth. Avoid 3 column websites that have navigation on both sides. If you have a three column website just use a column for graphical advertisement. People are used to blogs with navigation in the right column. 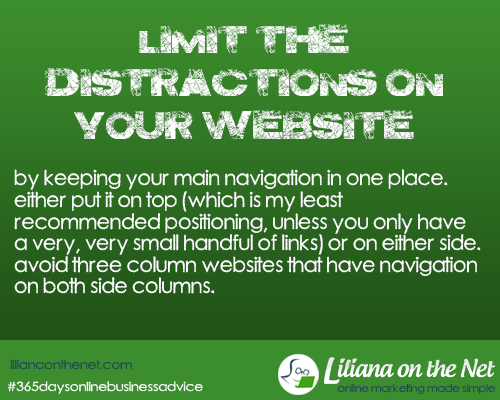 Avoid having your visitors look for the navigation all over the place. The only exception is if you show further navigation at the bottom as that is the last place that your visitors look at and they won’t become distracted. Avoid a website that is set to 100% width of the screen. It looks OK in smaller resolutions but makes it unreadable in higher resolutions. The reader has to scroll left to right to read it. You lose control when your site gets resized and you should never lose control over your marketing messages. Things change anyway when reading websites on mobile devices. How wide your page is, depends on your site design and any columns you may have for navigation or newsletter sign ups. As a guideline, I’d recommend the actual main body text area of your site to be no wider than 960 pixels. The theme on your blog must be responsible to allow for changing for mobile devices. If you are selling a product, try to have all information on that page, do not make visitors hunt for information. It is OK to have links that open in new windows that give more information about the product or a review. If the visitors get lost, they will give up the quest for information and you will lose them. People are used to underlined blue hyperlinks. There is a tendency to have hyperlinks in a contrast color from the colors used in the website. (Mine are purple that is the contrasting color of the green in this website). I also use visible buttons for people to click on. If your links don’t look like links people aren’t going to click them! How simple you make your page will depend on the page’s purpose. If you are trying to sell a product, the simpler your design, the better. If it’s a content site, you’re more likely to have more distractions like your navigation and advertisements. Blogs, by their nature, also have more links and a few more distractions. That’s okay but make sure the links are purposeful. I use genesis for this website because it is responsive and adapts well to mobile devices. Genesis framework is excellent. You could just buy the framework and easily access affordable designers. If you prefer to alter it yourself you could buy all the themes, only if you are planning having many blogs/corporate websites. Great ideas! I’m doing many of them on my blog, but there’s always room for improvement. Thank you for the tips! Laurel Regan recently posted…Poll: Hindsight or Foresight? Great tips! I flee from websites that are too “busy” and cluttered, so it would behoove all of us to make our websites as pleasant-looking as possible.